After working on this the entire summer, I am so pleased to introduce you to the finished Sand Drift Quilt! The pattern is now available in my craftsy store. I hope you enjoy all of the pictures I took at my sister-in-law's house. She has a beautiful front yard. 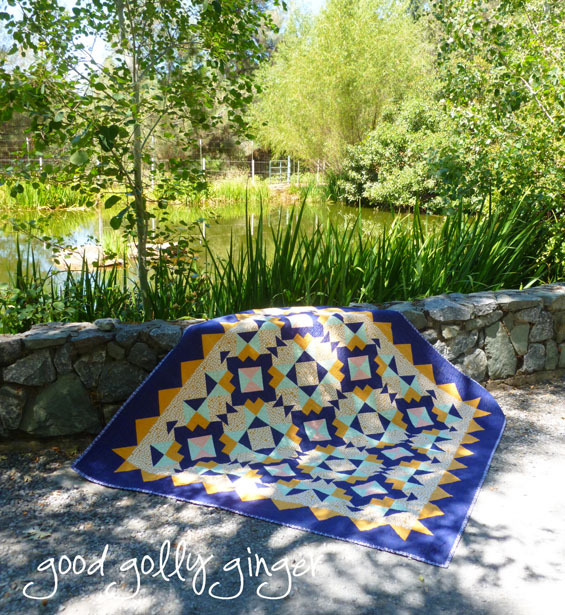 The Sand Drift quilt pattern is inspired by Native American style. The colors are warm and natural. I used Arizona (April Rhodes) fabric line by Art Gallery Fabrics. When I saw this line, I knew I needed to design a quilt for it. I never knew that I was inspired by Native American style. I did know that I love fabrics that have a nature vibe. Native American style certainly has the natural vibe. So that makes sense. The striking geometric pattern really catches my eye. 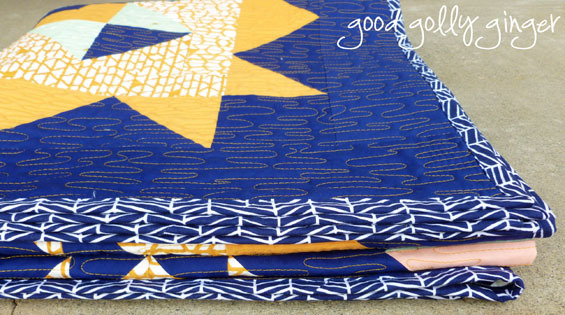 The Sand Drift quilt has a lot of movement to it with a secondary star pattern and connecting flying geese. The quilt is finished with a quarter square triangle border. I used 2 print fabrics for the front of the quilt: Arizona Canyon Wall and Arizona Triangle Token. For the complimentary solids, I used Kona Cottons in Peach, Ochre, and Nightfall. I quilted the quilt with an all-over water pattern in Isacord thread. I used gold color and the texture is amazing! I used a total of five large bobbins of thread. That is a new record for me. I'm sure that I will break that newly set record soon as I am getting much more comfortable quilting. For the backing, I used some more Art Gallery Fabrics and some other fabrics that matched the natural theme. The right side fabric is Arizona Agave Field. On the left side, I used Arizona Triangle Tokens(not shown), Arizona Desert Blanket, Reminisce Meadow in Gold, Winged Plumage in Apricot, and Arizona Tomahawk stripe. I bound the quilt with Modern Meadow Herringbone in Lake. It matched perfectly! The quilt block is simple to make, and the pattern is now available in my craftsy store! It won't take you an entire summer to create this quilt. 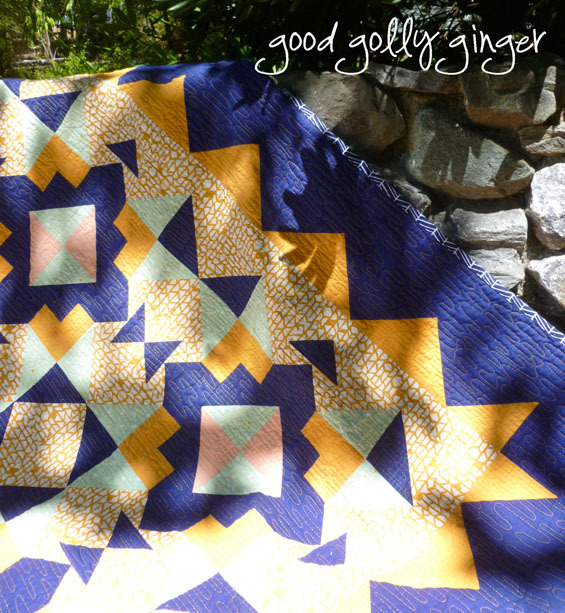 I have included several tips to make the quilt creation even easier. There are a total of eight pages of pattern instructions, fully and professionally illustrated (if I might say so myself). There is also a coloring page included so you can audition your own fabrics. Purchase the pattern here. To all who purchase the Sand Drift quilt pattern: Thank you so much for supporting my small business! I'm a stay-at-home mom with two young children, and I am a quilter. This pattern is like another baby to me (just not as noisy). I really hope you enjoy the Sand Drift quilt! Stay tuned for next week...It's my first blogiversary! There will be a fabric giveaway!!! Beautiful! Your color palette is stunning and the water ripple effect of your quilting is perfect. 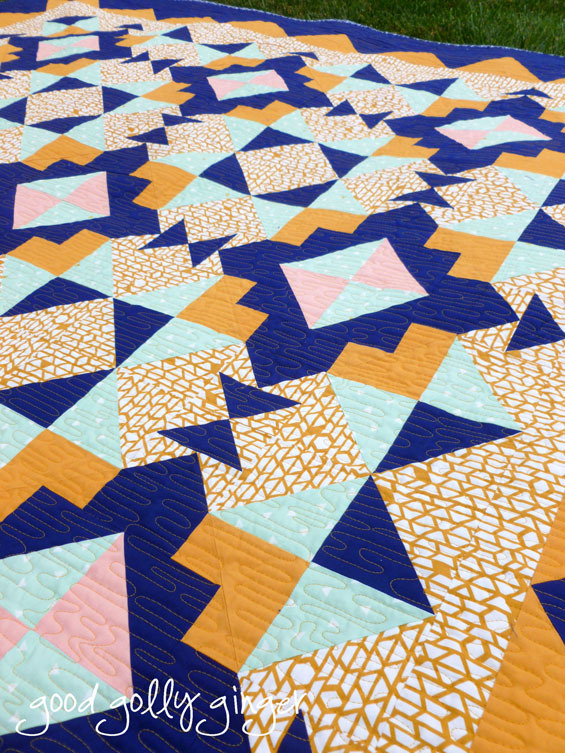 Large block quilts are so cool the way they have secondary patterns. Nice design and excellent craftsmanship! You should be proud. Ok! Despite all the projects I have lined up, I bought your pattern. It is beautifully illustrated and well thought out! I just hope I am as successfully with picking a color palette as you were. Thank you so much! Your words made my heart sing. I hope you will share pictures of your Sand Drift quilt when you are finished! Your quilt is really pretty. I love the way you quilted it. 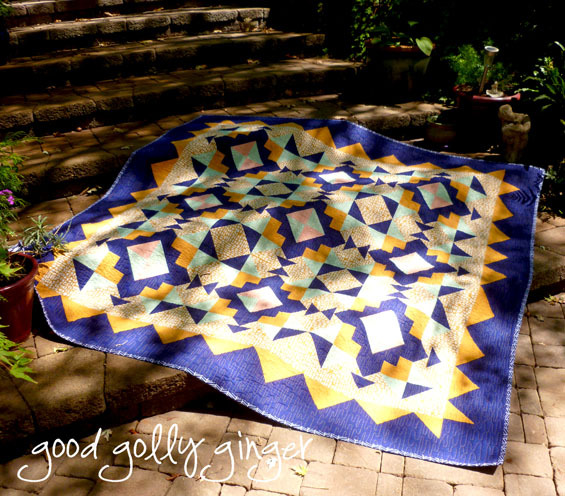 The quilting looks so wonderful - I love the water pattern and the texture it gave the quilt is perfect. Congratulations on you pattern publication! This is lovely! I love the herringbone binding, especially--it does match perfectly and ties it all together! 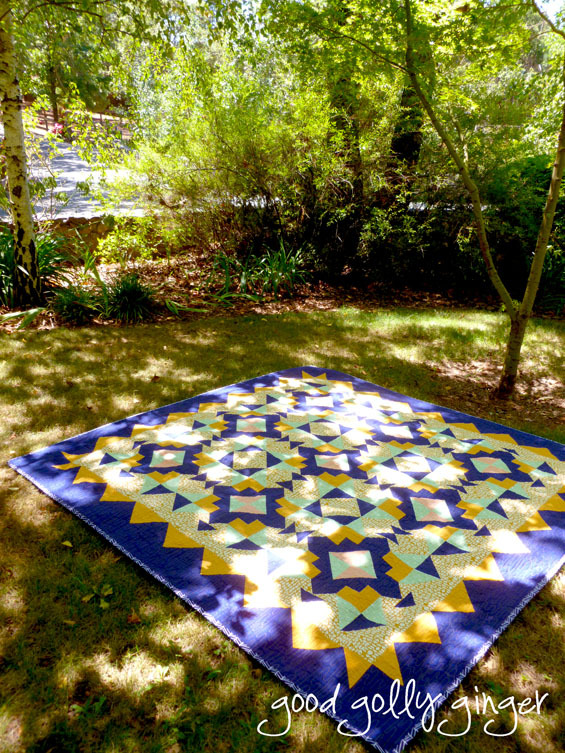 What a fun idea--creating a quilt pattern inspired by a fabric line. I just may have to try that! Kaitie, so glad you shared on N&TT! This is a beautiful quilt - very summery and cheerful! The quilting is perfect for your whole theme too. Love it! What an amazing finish. I love how you quilted it, and your photos are stunning. I love this pattern, your fabric choice and photos! This one is definitely going on my to get list! Your baby is beautiful - and makes a beautiful noise. I love the fabric you used to showcase the pattern. The quilt is stunning. It is on my to do list now. I don't have a bucket list - I have a to do list. I love it! The quilting pattern and the binding are both perfect! Congratulations. Thanks for linking to TGIFF. 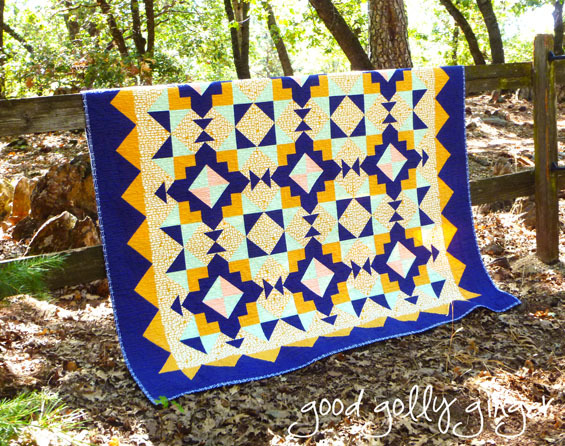 Beautiful quilting and I just love this pattern! 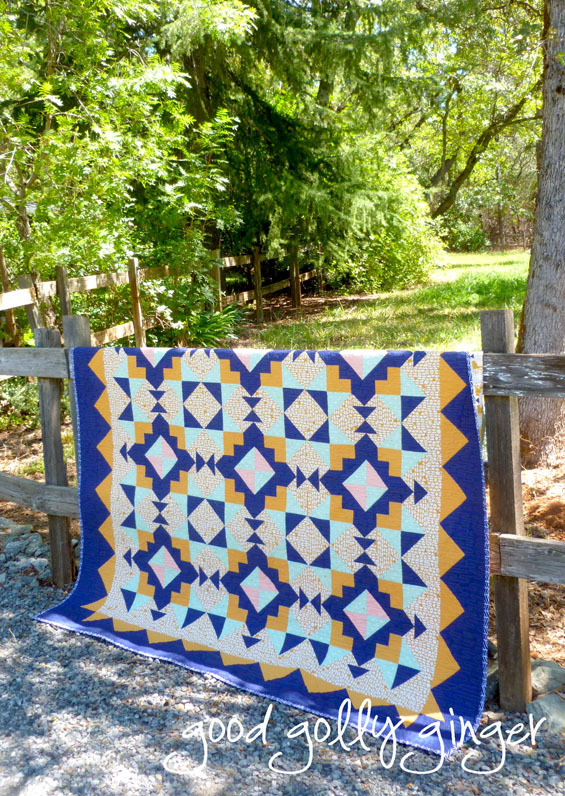 Congratulations on the finish of this striking quilt and the pattern. Really like your colour choices... and your FMQ design is fabulous! 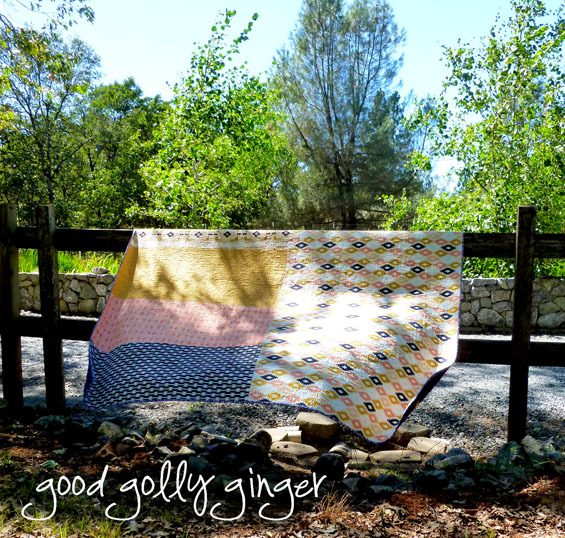 The shoot location you chose looks like a lovely place to spend an afternoon... isn't it great to photograph quilts outdoors? Congratulations on the great finish and for publishing the pattern! 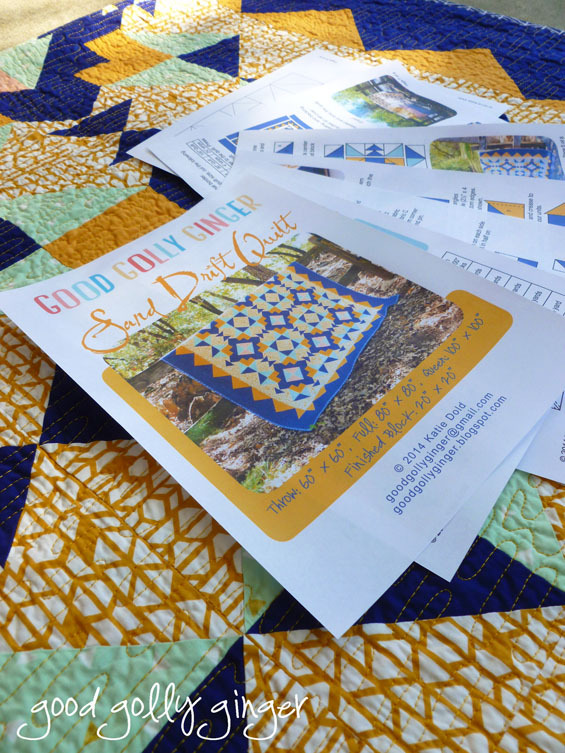 The coloring sheet sounds like such a great idea to help quilters get started! Originally from New Mexico, I was quite attracted to your Arizona fabrics! An amazing design and those fabrics are gorgeous! Love, love, love the quilting. Congratulations on a fantastic pattern, Katie!!! I just love love love it. I hope it does really well. I love your pattern and love Arizona!! That is definitely something to be proud of. I love the colors and fabric choices. Love it! !